Thank you to the Long Island Doula Association and all the Participants! You are invited to be part of our latest educational and training event - Perinatal Mood Disorder Workshop: Building a Safety Net in Our Community. 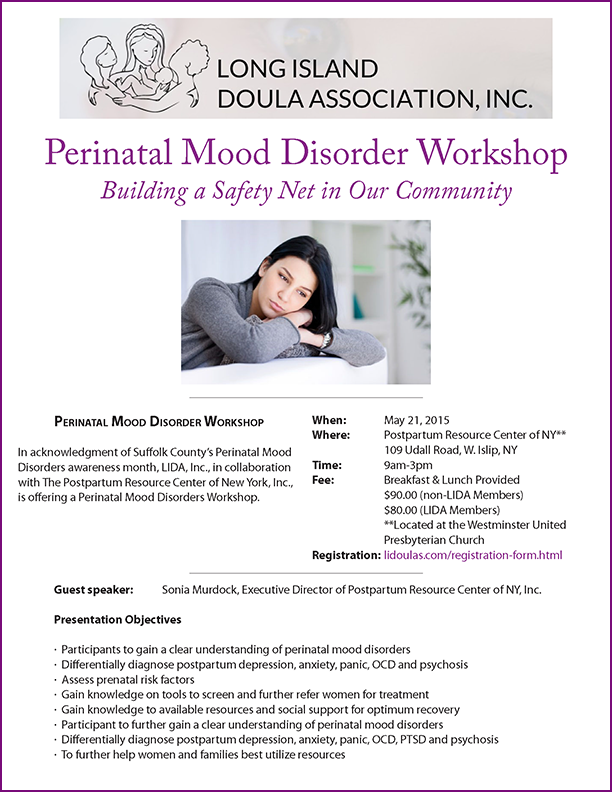 As an acknowledgment of Suffolk County’s Perinatal Mood Disorders awareness month, LIDA, Inc., in collaboration with The Postpartum Resource Center of New York presents this full-day workshop. Details are below. Guest speaker: Sonia Murdock, Executive Director of Postpartum Resource Center of New York, Inc. Please help spread the word about this event by sharing this page with those you know on social media. The flyer is available in two formats: Perinatal Mood Disorder Workshop: Building a Safety Net in Our Community (pdf) and Perinatal Mood Disorder Workshop: Building a Safety Net in Our Community (.png). The Postpartum Resource Center of New York conducts educational trainings throughout the year? To see other training events, go to the menu tab events – then trainings. Or, please feel free to contact us by email, phone or mail using on our contact pages.